Dream Pod 9: Utopia Kickstarter Update & Utopia Force Special Rules Video! Now just under 7 days left in the Heavy Gear Blitz Utopia Armed Forces Plastic Miniatures Kickstarter with $18,793 CAD Pledged (62%) of our $30K CAD Initial Funding Goal. We'll keep working hard at getting news out about the Kickstarter to have a strong last week and a successful campaign with everyone's help. The Utopia Kickstarter ends on Saturday evening February 3rd at 7:02 pm EST. Here is a link to the Kickstarter page to go check it out and show your support. For this update we made a short video (click the link below) focusing on the Utopia Special Rules when making a Generic Utopia Force (Army). Sorry if the video is a bit shaky at spots it was made with a handheld iPhone in one take and no editing. Also a quick errata the HGB Living Rulebook page mentioned at the end of the video is wrong, it should be page 204. I'm going to have to learn how to do some video editing in the future, as it took about 10 tries to get that best take that was uploaded to the YouTube channel. 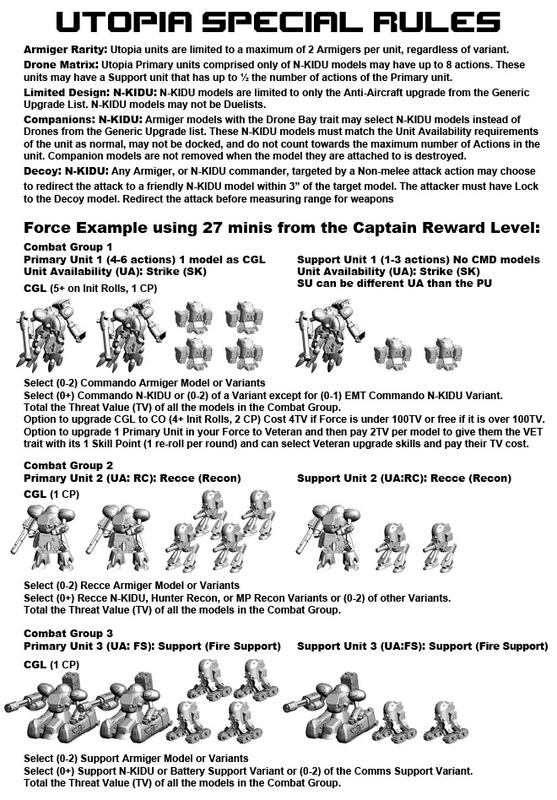 Attached are the 3 pages that we created for the video explaining the Utopia Force Special Rules. You can download the HGB Living Rulebook ebook at the link below, checkout page 204 for the Utopia Special Rules. On that page are other Utopia Force Sub-Lists like the UCFT - Utopian Combined Forces Troupe with its Well Supported special rule: Each Primary Unit in this Force may have two Support units. 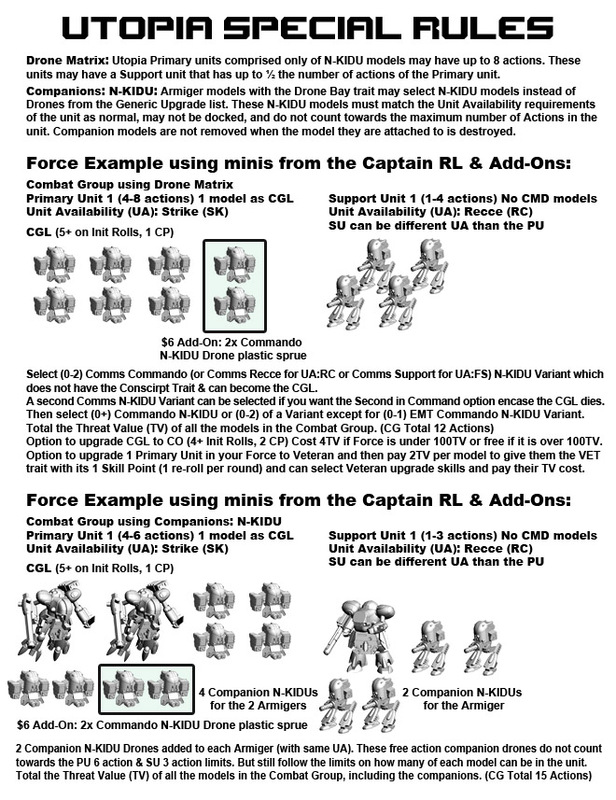 And Allies special rule: Choose one CEF, Black Talons, Caprice, or Eden Support units from the chosen Faction Force list to attach to Utopian Primary units. 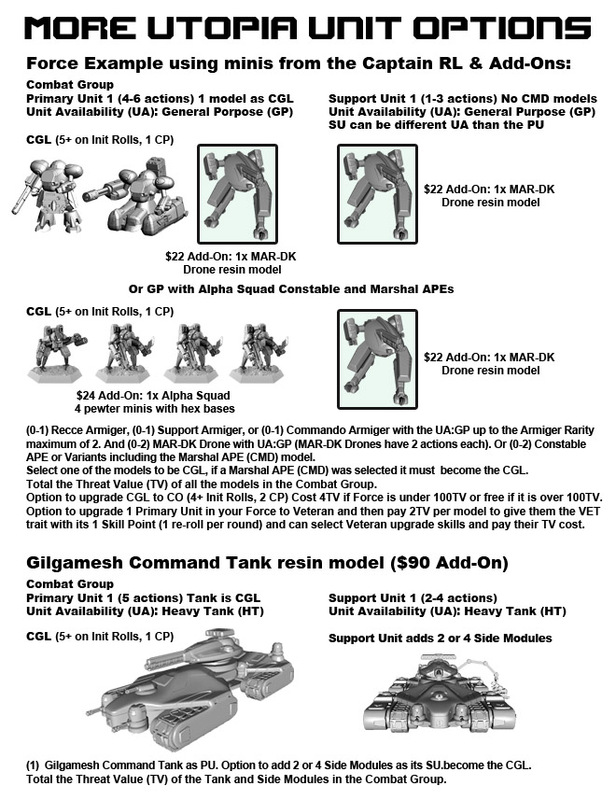 And 3 more Sub-Lists each specialized for Commando, Recce, or Support Armigers. Next update will include more Heavy Gear Blitz rules and game play videos, until then keep sharing news of the Utopia Kickstarter with friends and the online community to help us get the word out to everyone. Home › Blogs › Robert Dubois's blog › Utopia Kickstarter Update & Utopia Force Special Rules Video!